Stricter mortgage rules went into effect Monday in Canada, but a recent survey suggests many people are unfamiliar with the changes. Ottawa has moved to cut the maximum length of an insured mortgage to 25 years, effective today. New rules Ottawa announced last month that will tighten Canada's mortgage industry go into effect today, but a major Canadian bank says many people are unaware of what exactly is changing. In June, Finance Minister Jim Flaherty unveiled major changes to the limits of what the Canada Mortgage and Housing Corporation is allowed to insure, effectively tapping the brakes on a housing industry that many experts worry has become too hot. Starting Monday, lenders can only issue home equity loans up to a maximum of 80 per cent of a property's value — down from 85 per cent. And anyone wanting to buy a home worth more than $1 million, for instance, must now have a down payment of at least $200,000. But the biggest change of all is the shortening of the maximum amortization period for government-backed insured mortgages to 25 years from 30 years — forcing borrowers to pay back their debts sooner. That will reduce the amount of interest they'll pay over the life of the loan, but make mortgage payments larger as more debt gets paid back with each payment. Mortgages must typically be insured if the borrower has a down payment amounting to less than 20 per cent of the home's cost. Amber Dykstra of Edmonton sped up her home-buying plans by a year when she heard about the mortgage rule changes. She finalized her 30-year mortgage on Monday just before the rules were tightened. 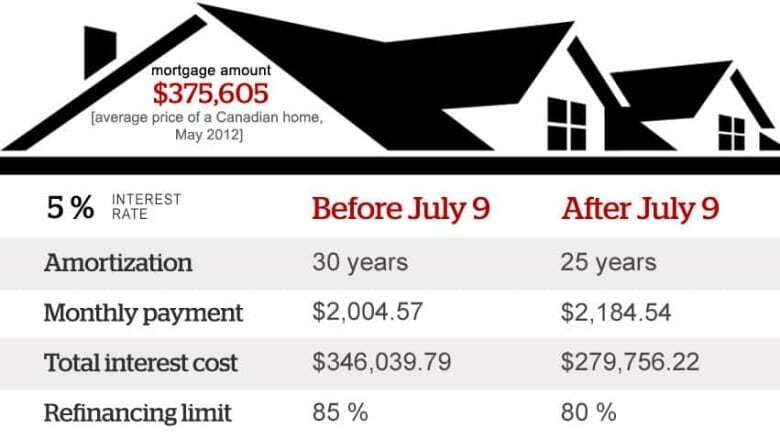 "The difference between a 25-year and a 30-year amortization can be $200 or $300 a month," she told CBC News. "That can be the difference between eating soup and real human food." One mortgage broker estimates that a family with a household income of $75,000 will see the amount of mortgage they can qualify for reduced by about $50,000 when their allowable maximum amortization is reduced from 30 years to 25 years. Some mortgage experts say that could have a big effect on the housing market. "I believe that we could very much see a reduction in home prices, at least in the short term, while things stabilize," says Halifax mortgage specialist Audrey Wamboldt. But even though the impact of all of these new mortgage moves is expected to be significant, a survey conducted by Pollara for Bank of Montreal found only about half of those surveyed were familiar with the changes brought in by the federal government. And yet two-thirds of respondents indicated they were familiar with the current mortgage rules in Canada. Only 45 per cent of those surveyed June 29 to July 4 were aware that the maximum amortization period has been shortened by five years, the poll found. Even among those who were aware of the new rules, a full 26 per cent of poll respondents believe that the maximum amortization length is still 30 years. The limits on Canada's insured mortgage market are now back to where they were in 2006 before the Harper government started tinkering with the rules to allow more people to qualify. The Pollara survey consisted of an online sampling of 1,000 Canadians between June 29 and July 4.